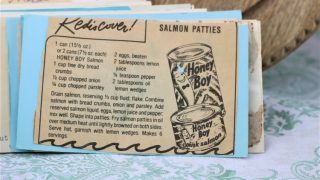 Front of the recipe card for Salmon Patties. 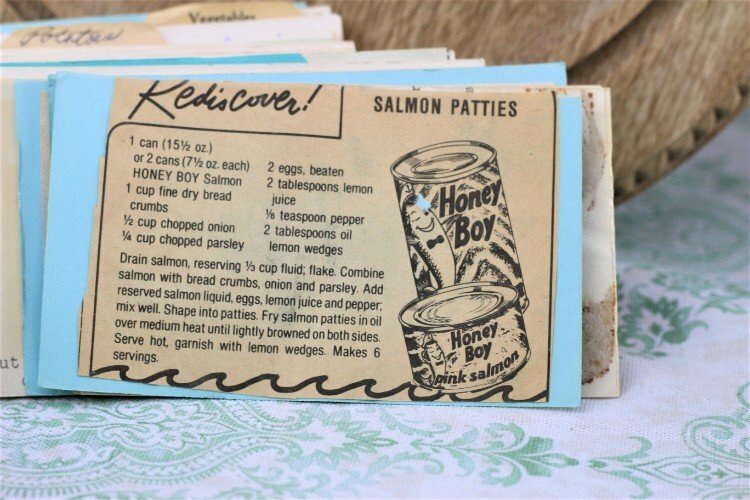 There are lots of fun recipes to read in the box this recipe for Salmon Patties was with. Use the links below to view other recipes similar to this Salmon Patties recipe. If you make this Salmon Patties recipe, please share your photos and comments below! Drain salmon, reserving ⅓ cup fluid; flake. Combine salmon with bread crumbs, onion and parsley. Add reserved salmon liquid, eggs, lemon juice and pepper; mix well. Fry salmon patties in oil over medium heat until lightly browned on both sides. Serve hot, garnish with lemon wedges.